We recently found ourselves at Hodge’s, near E 4th in Cleveland. Actually, it was carefully planned – with two small children, we no longer just “find” ourselves anywhere. Hodge’s is a recent addition to the Cleveland food scene, owned by Chris Hodgson, of local food truck and Food Network fame. The menu is a “modernized take on global comfort foods,” and, as we prefer in our restaurants, seeks to source as much as possible locally. We went for the Tuesday special (2 entrees, 1 app, 1 bottle of wine for $40) and left satisfied. The overall ambiance is nice, not too loud, and if you can manage to corral a seat, they have a lovely patio available for nice days (which, unfortunately, was booked for a party when we went). Chef Hodgson was very visible, stopping at each table, which doesn’t happen often, but certainly adds to the experience and our impression of the establishment. 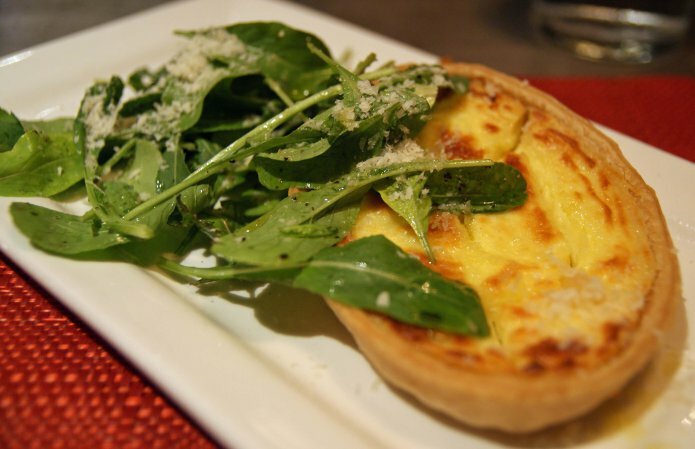 For our appetizer, we tried a goat cheese and leek tart, with sweet onion jam and arugula. We loved it. S is not usually huge on the unique flavor of goat cheese, but the goat cheese in this was fairly mild, with a rich and custardy filling. The crust was flaky, and the arugula had a nice zip that worked nicely either as a break between the richness of the tart, or even in the same bite. With an entree order, you’ll also get a skillet of cornbread with honey butter. That’s some good cornbread. S selected a house-smoked pork shank, served with baked beans and crispy buttermilk onions. The shank is a good-sized hunk of meat (which she knows from experience), but had a pleasant smoky flavor and just fell apart on the fork. The beans also had a nice smokiness, and the onions were a fairly typical french-fried onion. Service was unique with this dish, as it came out on a wooden cutting board. I went with the short ribs, served atop a Yukon Gold and cheddar puree, along with watercress, tomato, and a balsamic jus. 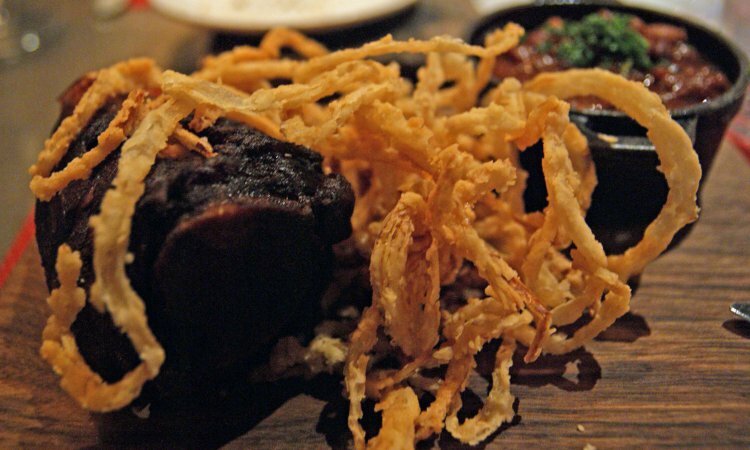 The short rib, as with the shank, was delectably moist and barely even required chewing. 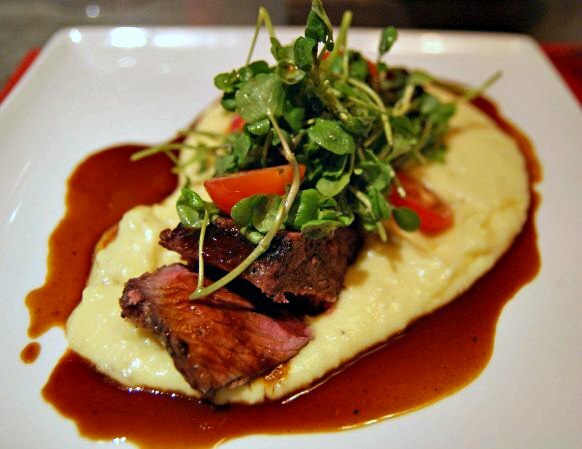 The puree was very flavorful and the jus added that aged balsamic flavor without burning the throat like straight vinegar is wont to do. 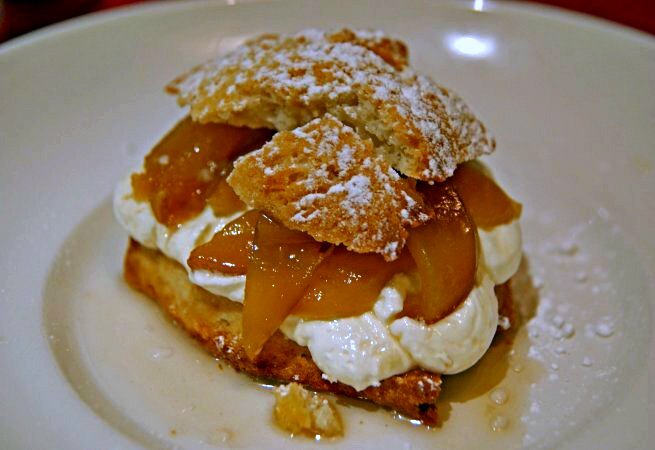 Surprisingly, our least favorite dish of the night was the dessert, a peach shortcake. The peaches had a gentle bourbon flavor, and the cream was great, but the shortcake was a little on the dry side, almost more of a soft cookie than what I envision a shortcake to be. A good summer dessert, I was just expecting it to be a little cakier. The verdict: Hodge’s earns 5 1/2 stars out of seven. The food was all very good, service was fine, and prices are fairly reasonable (though the Tuesday special makes it a great deal). A nice addition to the E 4th area.